If your peach tree's leaves are curling or displaying puckered areas, you are in need of a treatment method for leaf curl. This disease can cause mild to severe tree injury. Identify symptoms so you know how to assess whether your tree is suffering from leaf curl; also determine reliable treatment methods to keep your peach tree healthy and vigorous. Understanding what peach leaf curl is and how it attacks your peach tree is an important aspect in learning how to protect your tree. Peach leaf curl is a fungal infection caused by the fungus Taphrina deformans. Peach leaf curl spreads sporadically, carried by wind and water. The collection of spores inhabit leaf surfaces and resemble a powder-like substance, according to the Purdue University Cooperative Extension Service. Leaf curl occurs during spring when buds open and leaves are susceptible to invasion. Look for new leaves that appear malformed, thicker, curled and those that display abnormal coloring like a lighter hue or a reddish tone, advises Purdue University Cooperative Extension Service. In severe cases, the tree may lose nearly all of its leaves and end up decline. A weakened tree is more vulnerable to injury from cold temperatures as well as invasion by other pathogens or insect pests. Peach fruit may also appear shiny and will fall from the tree. Vigorous trees kept healthy through appropriate care are less vulnerable to disease invasion and are more likely to have the ability to fight off illness. Plant peach trees in full sun exposure with abundant sun during the morning hours. Morning sun is significant because it assists in the drying of dew that acts as a prime breeding ground for fungi, the cause of leaf curl on peach trees. 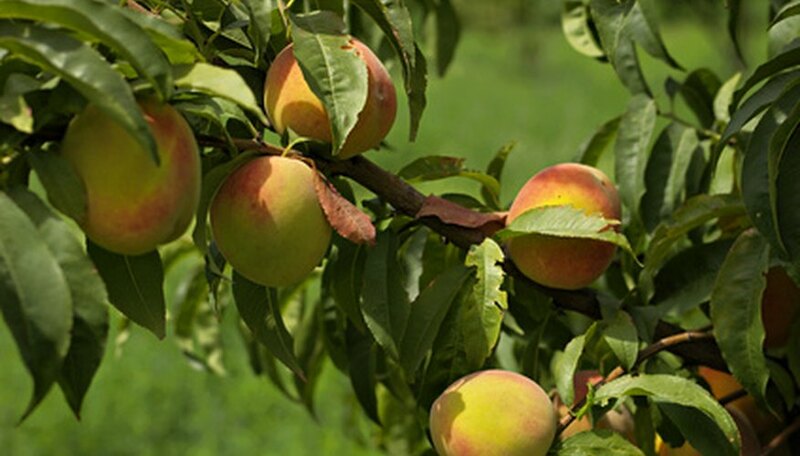 Peaches are adaptable to many soil types, but ideal soil conditions include sandy loam or sandy clay soil with excellent drainage and a pH level of approximately 6.5, notes Clemson University Extension. Avoid waterlogged soil as peach roots will quickly die, leading to the death of the entire tree. Chemical control is effective when used as a preventive measure. Spray trees before bud swell while the tree is dormant; only one spray is necessary any time from the end of fall to the end of winter. Apply one of the following: copper fungicide, chlorothalonil, liquid lime-sulfur solution or Bordeaux mixture (copper sulfate and lime), advises Purdue University Cooperative Extension Service. If your tree is already showing signs of infection, chemical controls will not work. You can remove and destroy affected plant parts and thin the fruit from the tree to match the extent of leaf damage. However, leaf curl on peach trees often goes away on its own and damaged, fallen leaves become replaced with healthy vegetation. Wait until fall and apply a fungicide to prevent any further occurrence of leaf curl. Additionally, consider planting resistant peach tree varieties to avoid this problem; resistant varieties include Indian Free, Muir and Q 1-8, according to the University of California IPM Online. How Do I Treat My Peach Trees With Leaf Curl?